Commonly known and advertised as ‘black pearls’, Tahitian pearls are one of the best finds of the jewellery market, if you know how to select them. While people usually tend to go for white pearls as their base, standard option when it comes to pearl jewellery, Tahitian pearls can actually be the better choice. Here are the main advantages of Tahitian pearls and why you should consider switching your white pearls with for some black pearl jewellery. The desirability of Tahitian pearls over the traditional white pearls will be argued from more than one point of view: both as a style choice, and as an investment choice as well. A beautiful Tahitian pearl necklace. First of all, remember that not all Tahitian pearls are black and not all black pearls are Tahitian. We will give you more details about the colours which natural Tahitian pearls can take right below. But for now, it’s very important to note that most stores which advertise black pearls within their range of jewellery option aren’t probably dealing with actual Tahitian pearls, and use artificially dyed pearls instead. Whenever you see ‘black pearls’ advertised somewhere and the store does not give you more details about their origin, you shouldn’t trust that you are presented with authentic Tahitian pearls. Instead, if you see ‘natural black pearls’ being advertised, you may actually be presented with real Tahitian pearls. These get their name from the fact that they are only cultivated in the region of the French Polynesian islands, using black lip oysters (Pinctada Margaritifera). This type of oysters makes the Tahitian pearls develop their dark colours and undertones, creating a type of pearl unique in the world. 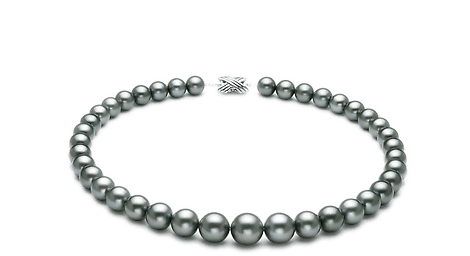 Since this type of pearls can only be produced in one geographical area, the Tahitian black pearls are a much sought-after commodity, making them both rare and very precious. As explained above, there are many counterfeit black pearls on the market, which owe their colour to dyes rather than to being a natural product of the black lipped oysters in the Tahiti region. The pearls which are certified Tahitian pearls (aka ‘natural black pearls’) can be anything, from a dark green to a dark grey or dark purple. See the greenish hues reflected by the nacre of the pearls in this exquisite set of black Tahitian pearl earrings (featured below). A simple pair of stud Tahitian pearl earrings. Some Tahitian pearls may be closer to silver or grey than to black, and even appear light-coloured (though not completely white). As well as any other natural pearl, they can also vary in shape and size. In order to obtain the perfectly round black Tahitian pearls that make the best necklaces and bracelets, pearl cultivation is necessary. For pearl cultivation, the same black lipped oysters are used, in order to make the resulting pearls authentic Tahitian, of course. One of the best perks of this particular species of pearl-producing oysters is the fact that they have more space to accommodate the growing pearl. This means that Tahitian pearls tend to be larger than any other type of natural pearl (Akoya and freshwater varieties included), making them more valuable. Whenever you manage to find a good deal on Tahitian pearl jewellery, you should definitely take advantage of the offer, because the piece of jewellery in question is more than a pretty frivolity, and is actually a sound investment. As long as you don’t damage your pearls, they should increase in value over time, especially as prices can fluctuate and pearls can become rarer. A statement piece of pearl jewellery may one day become a more valuable family inheritance or legacy than you could imagine when buying it initially. While all the above holds true for all pearls in general, this investment potential is even higher in the case of Tahitian pearls and jewellery, because of their naturally larger sizes. Keep that in mind the next time you see a set of jewellery featuring Tahitian pearls at a bargain price. Pink pearls are for bridesmaids, white pearls are of course classic, and both colours can easily be worn by girls and little girls alike. But black pearls, on the other hand, are an edgier choice which screams of sophistication. For a more grown-up style, whether you feature other less conventional elements in your look or not, choose black. After all, a black coloured item is as much a classic choice as white is, only with an extra touch of sophistication about it. Another great perk provided by the special black lipped oysters that produce Tahitian pearls is the long lasting nacre and shine. The top layer that gives pearls their shine and colour reflexes tends to wear out in time (especially if the pearls come in contact with any abrasive materials), but in the case of Tahitian pearls, this layer is thicker to start with. This means you will be able to enjoy their full shine and beauty for a much longer time, and your pearls will also be more resistant than the other pearl types as well. We could go on and on about all the things which make Tahitian pearls a great choice for all jewellery fans and pearl aficionados. The main thing you should take away from all the advantages presented above is the fact that the origin and authenticity of the pearls make all the difference. Before looking at the design of a necklace or bracelet, you should fist verify that you can trust your supplier and that the Tahitian pearls you are reviewing are indeed authentic. If you’re not sure about the source of the pearls or the seller doesn’t clearly state any guarantees about that, then you should best move on to a source you can trust. All our collections of pearl jewellery come from verified sources, so if you continue shopping with us, this won’t be a problem, though. This entry was posted in PearlsOnly Blog and tagged black pearls, fashion tips, investment in jewelry, Tahitian Pearls by PearlsOnly Team. Bookmark the permalink.